A glance at successful people reveals a simple truth: successful people employ successful habits. Yet in schools, among all of the information and all of the skills that are taught, few concern how to employ and internalize these key habits of success. These skills are expected, even demanded, but are rarely taught, at least not with the attention of whatever else is deemed critical learning. 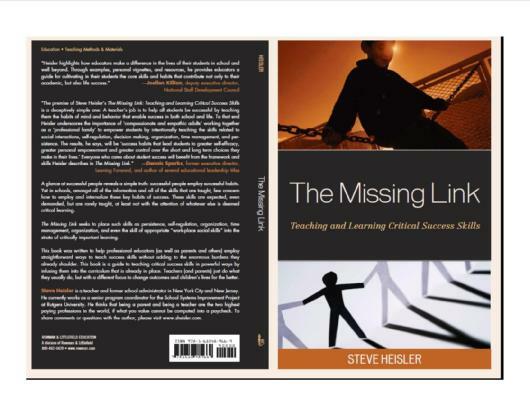 The Missing Link seeks to place learning such skills as persistence, self-regulation, decision making, organization, time management, and even the skill of appropriate “work-place social skills” into the strata of critically important learning. The Missing Link was written to help professional educators (as well as parents and others) employ straight-forward ways to teach success skills without adding to the enormous burdens they already shoulder. This book is a guide to teaching critical success skills in powerful ways by infusing them into the curriculum that is already in place. Teachers (and parents) just do what they usually do, but with a different focus to change outcomes and children’s lives for the better. Steve is my amazing uncle. This is both a disclaimer and a declaration that I've got a unique perspective. He's been my uncle, my mentor, my friend throughout my life. He's one of the most inspirational people I've ever met and I know that he is that for many other people. He's naturally the first person people call for advice and to talk. This book is the culmination of the thoughts, strategies, successes and failures - it's a must read for anyone looking to teach more than just what's in the curriculum and give students and others the tools to be successful in life. I really enjoyed all of this book. It was great to see that someone else believes in what I do when it comes to teaching and what works and does not work. This is written in ways so that all teachers will get it and have some tools to go back to school with. Thank you for writing what I have been thinking as a teacher for the last 28 years. You make me feel like am doing the right thing and I am ready, will and able to continue helping students placed in my care. "The Missing Link" takes us on a journey beyond what is simply best practice for academic growth; really captures the essence of what makes us human; and guides us in practical and humorous ways in developing skills that, when mastered, complement and support a child's possibility for life-long success. A must for educators at all levels! Important teaching tool for educators as well as parents. Very readable and accessible! Concepts presented can be used in the classroom and for teachable moments anywhere . Outstanding, perceptive, humorous and practical. New and veteran teachers can read, learn, laugh and be inspired.